This upholstered king headboard is a statement making piece thanks to its tailored look. Gray fabric, paired up with metal beads, keeps the interior of this bedroom trendy and comfortable. We all have that one space, the place that you go in your home to clear your mind and relax after a long day. 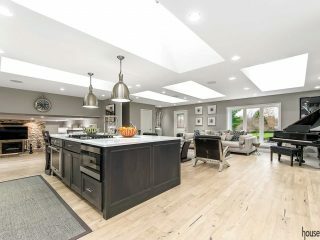 In recent years, more and more people are turning toward man caves and swanky entertaining areas, but with an overflow of technology and no real privacy, these much-hyped rooms often don’t provide the desired relaxation. 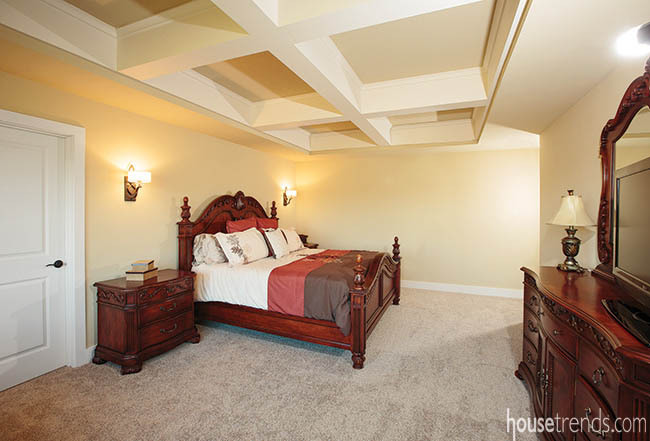 So we go back to the classics: master bedrooms. 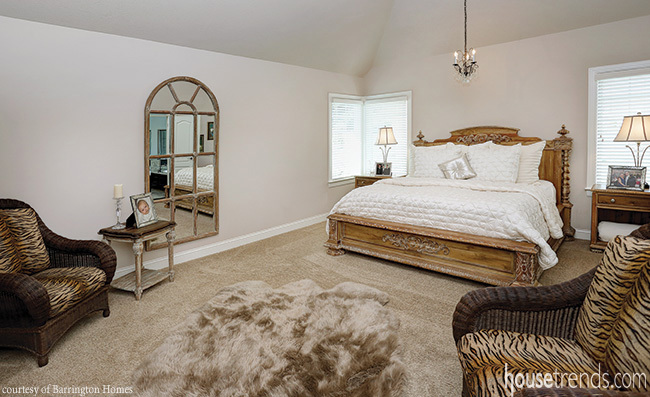 With plenty of legroom and a design tailored to your taste, master bedrooms were the original relaxing retreat, and now, as we stuff them with plush arm chairs and our favorite worldly comforts these become the perfect place to withdraw from the world for some good, old fashioned R&R. This bedroom eliminated the traditional headboard, instead opting for an elegant piece of wall art to serve as the backdrop to the bed. Bedding with bright splashes of white and fuchsia bring out the colors in the artwork. 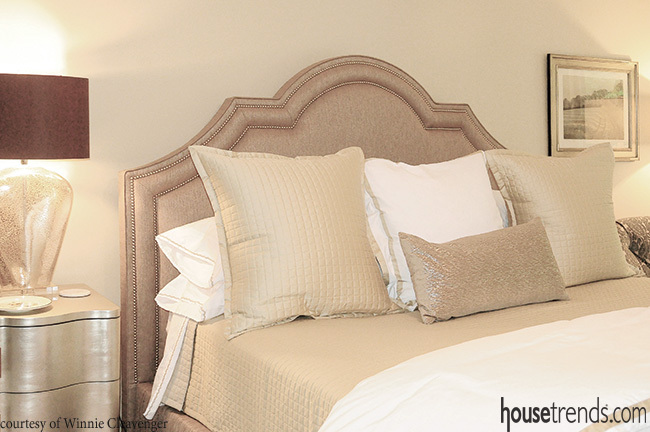 This padded headboard is covered in tufted gray fabric, setting the neutral tone in this master bedroom. The backdrop of gray and beige allows for the addition of the floral fabric and pops of chocolate and tangerine. The unique curved detailing of this wood headboard was carried into the design of the bed frame and nightstands to create a cohesive look in this cozy bedroom. A decorative four-panel room divider serves as the unconventional headboard in this bedroom. The simple white piece complements the closet door and stands out against the green-blue hue of the Sherwin-Williams Moody Blue paint on the walls. This upholstered headboard features metal brads for extra detail. 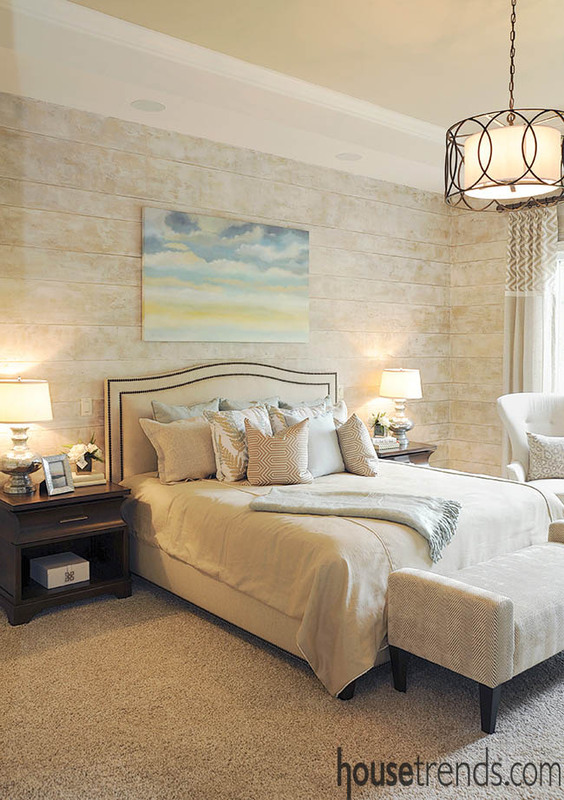 The formal design complements the feminine look of the bedding and window treatments. The herringbone pattern of this headboard serves as an eye-catching backdrop to the deep teal, burgundy and gold tones of the accent pillows and bedding. The shimmering bling embedded in the headboard also helps to bring out the touch of shine in the tray ceiling. A sleek strip of molding lining the wall and tray ceiling was stained to match the modern wood headboard. 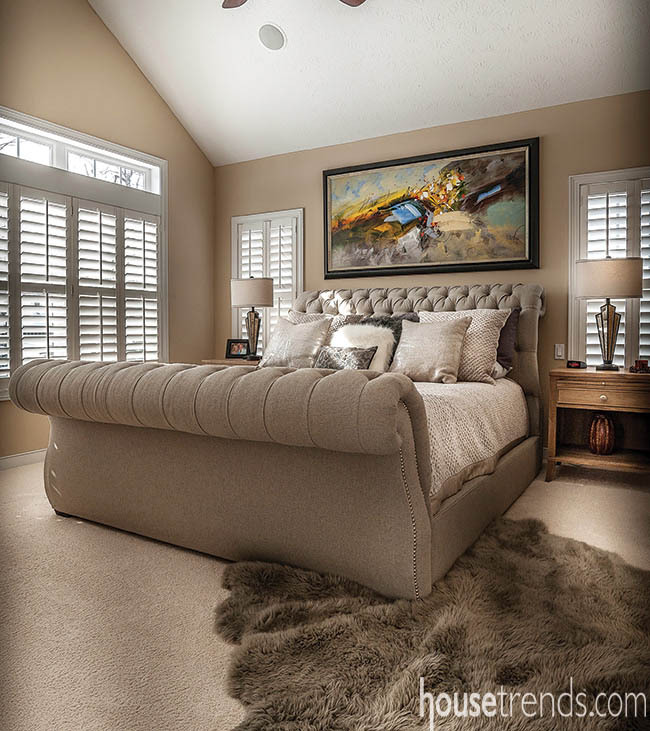 The effect transforms the bed into the alluring focal point in this master suite. This plush fabric-covered headboard completes the overall design goal in this bedroom—to create a serene sanctuary for guests by combining a soft color palette with plenty of natural light and a touch of warmth. This upholstered king headboard is a statement making piece thanks to its tailored look. 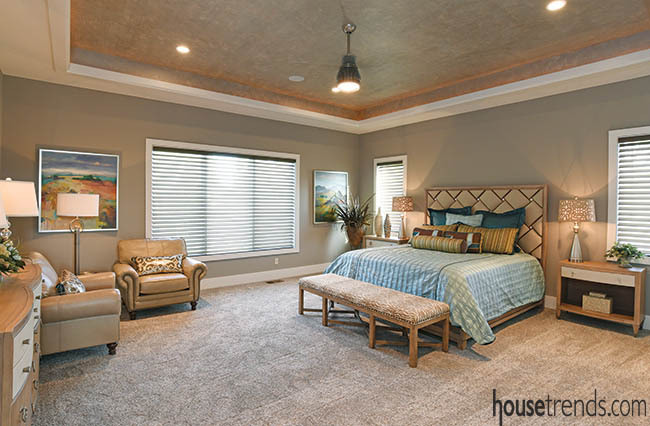 Gray fabric, paired up with metal beads, keeps the room trendy and comfortable. 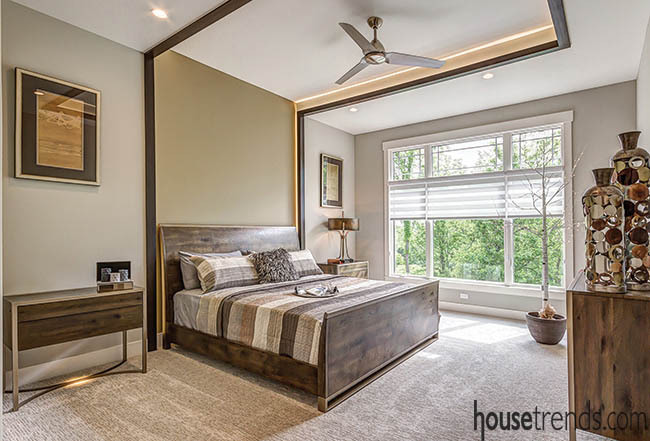 This custom headboard was designed to complement the tall ceiling and window height in this contemporary master suite. The extended headboard is covered in gray faux leather and accented with three rows of linear crystal ribbon. A stunning blackberry accent wall rules the roost in this bedroom design. 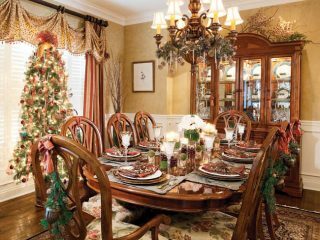 All of the other decorating ideas used in the space complement the warm color. 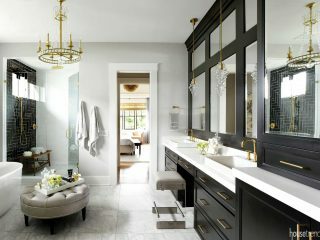 This space uses several inviting master bedroom ideas, including a large window to connect to the outdoors, a cluster of cushy chairs and a unique ceiling design that draws you in. 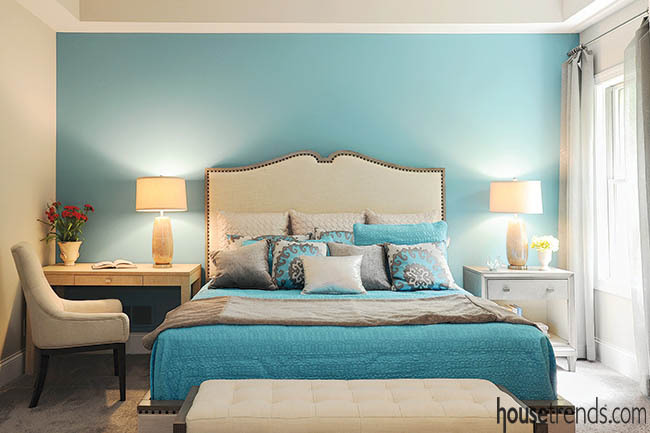 The white bedroom furniture in this space helps to throw all of the attention on the shocking turquoise accent wall. Soothing colors are scattered all throughout this bedroom design, from the slightly speckled walls to the soothing artwork over the bed. 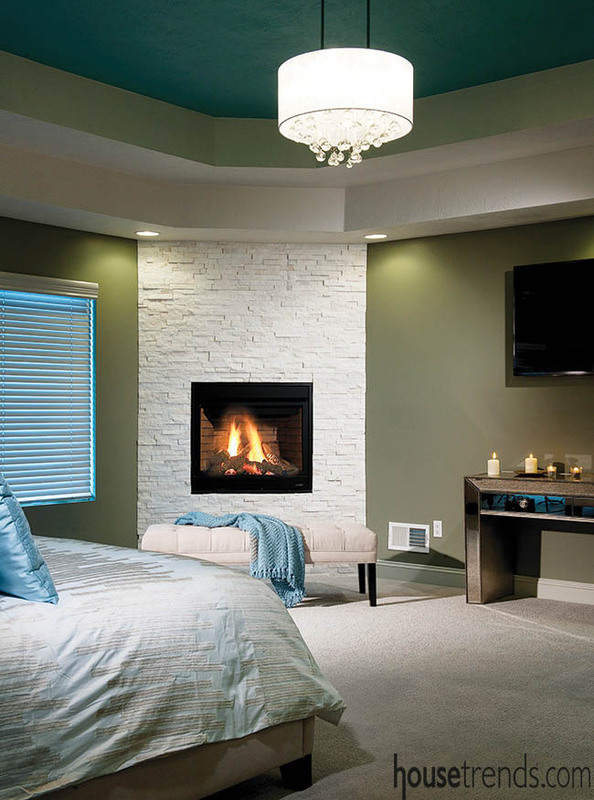 Situated just below the television, a fireplace helps to heat up this bedroom design. 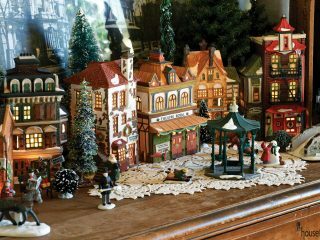 Though not completely necessary to the design, it does add a romantic vibe. A sparkling light fixture dangles from the engaging tray ceiling in this spacious bedroom design. Artwork and intriguing curtains lend a touch of color and mystery. 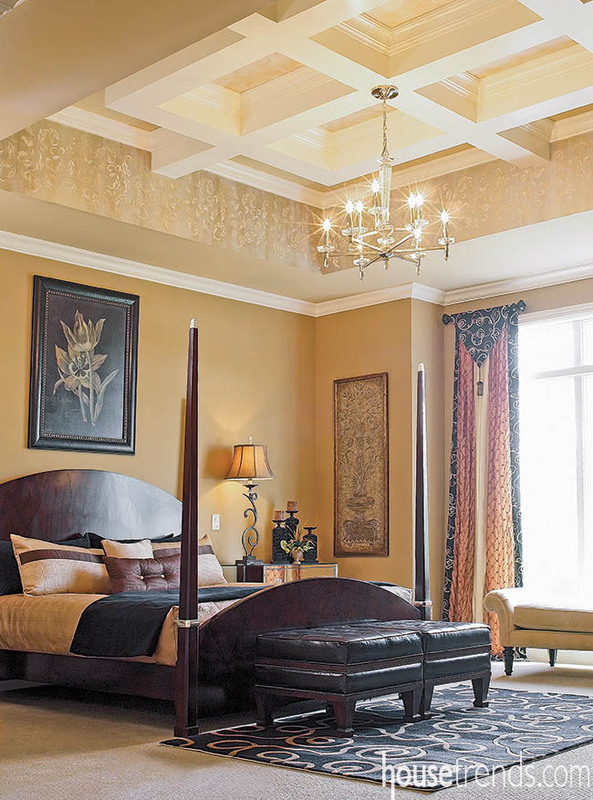 The dramatic lighting fixture and ceiling design paired with the regal bed frame give this bedroom a dark elegance. Splashes of color in the lime-green and bright-yellow throw create that extra step to invite those who enter this bedroom design to sit and stay a while. 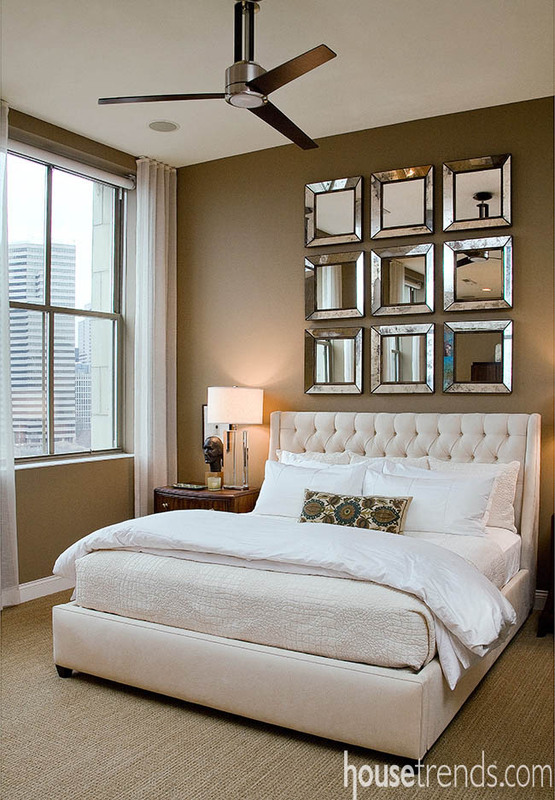 Some unique bedroom design ideas used in this space include placing individual squares or mirrors over the bed. This has the double benefit of reflecting back the room and serving as decor. 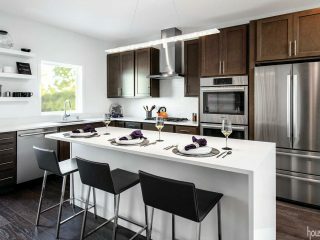 Convenient bedroom ideas, like an ensuite coffee maker and microwave, simplify the process of getting ready in the morning. A pair of armchairs provides a relaxing perch in this peaceful master retreat. A shared foot stool and tiny tea table create an intimate setting while still giving each person their own space to unwind and relax. 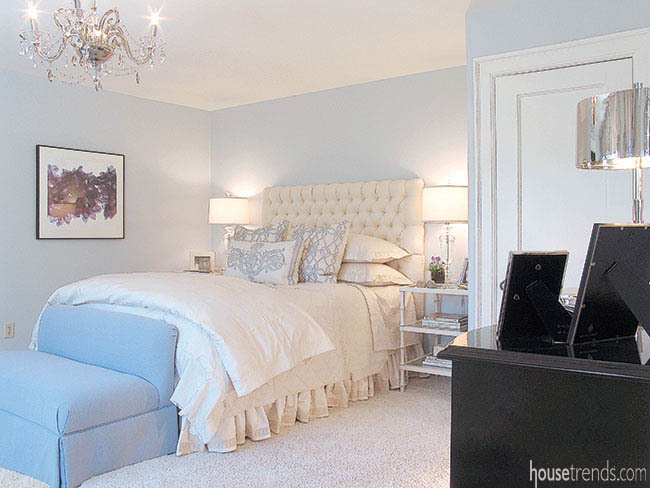 In refreshing shades of baby blue and crisp white, this master bedroom creates a calm retreat from the world. To give the space a little glitz and glamour, crushed seashells were used in the ceiling to make it sparkle when the chandelier is on. 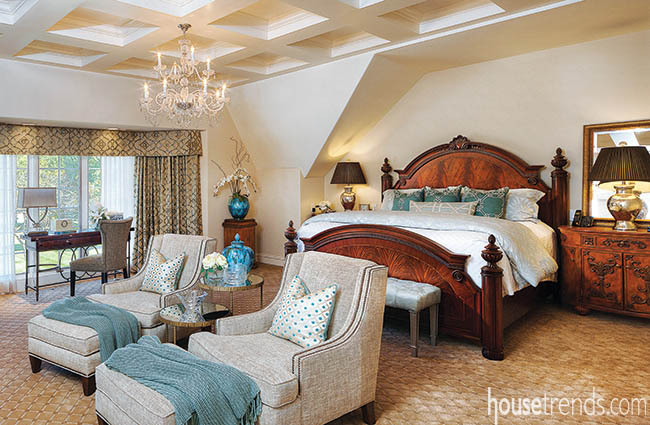 With soaring 16-foot ceilings, many people would think that the word “cozy” would never apply to this master suite, but these homeowners proved them wrong. 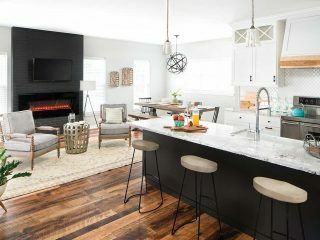 This space boasts a custom built-in king size bed, fiber optic reading lights and a Sparkfire ribbon fireplace beneath a 50-inch wall-mounted plasma TV. 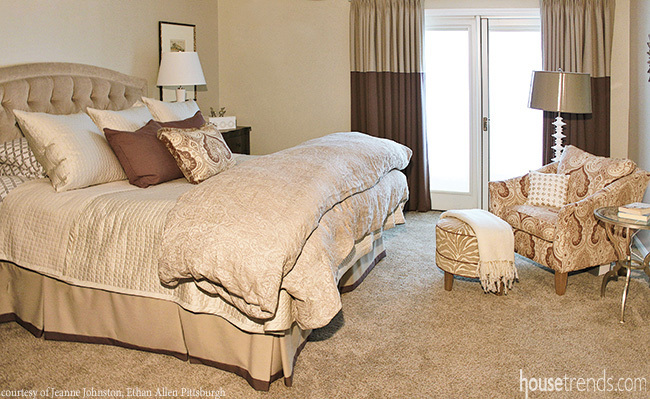 This master bedroom makes room for two with matching beige and blue upholstered chairs. 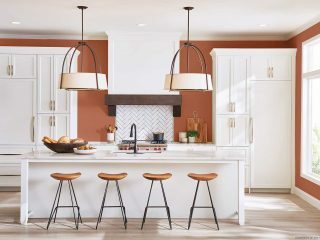 A chandelier emits a soft glow and brings a touch of elegance to the area and, coupled with the oversized windows, eliminates the need for harsh ceiling lights. 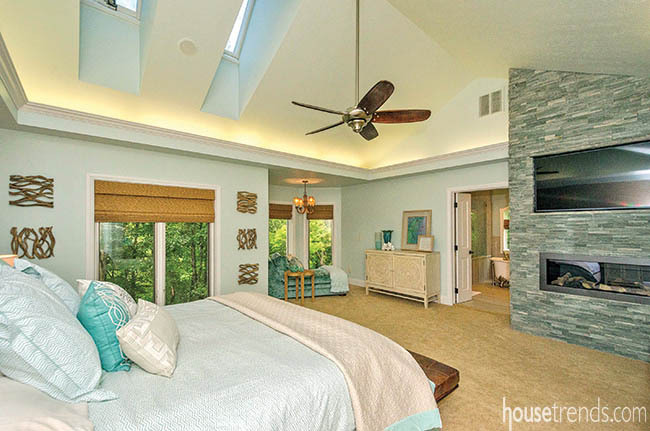 This first-floor master suite reflects the Tuscan design seen through the rest of the home. 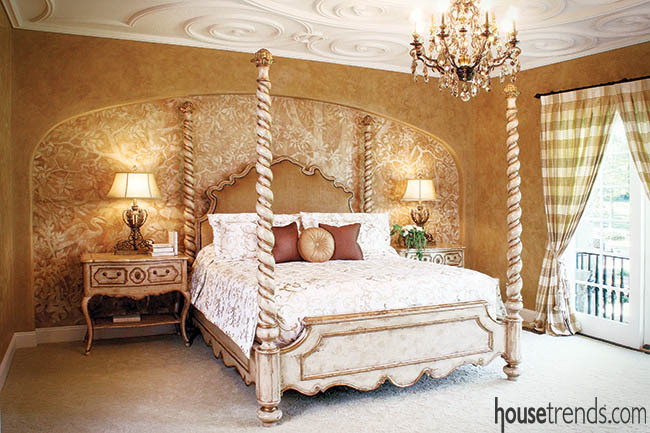 The ceiling swirls with intricate details, while the carved wooden bedframe adds interest and texture. Bedside lamps cast a warm glow on the mural-covered wall, lighting up a calming nature design. 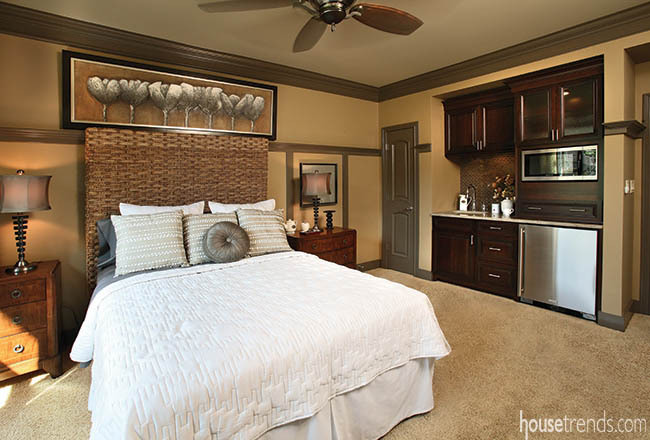 The bed isn’t the only thing making a statement in this master suite. In this space decorated mainly in neutrals, a bold piece of artwork situated just above the bed provides exciting pops of color. 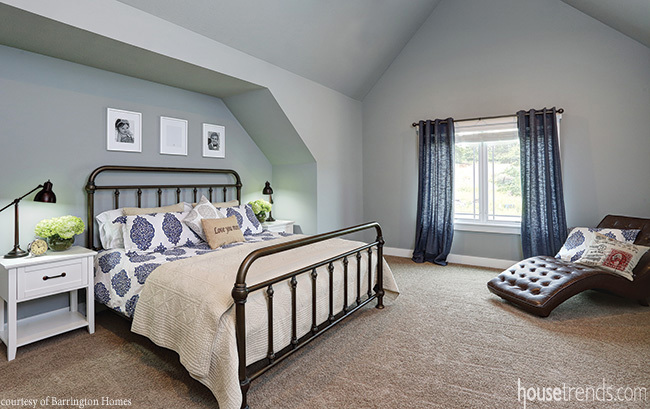 Teal and gray—two of today’s most trendy colors—set the tone in this master suite. 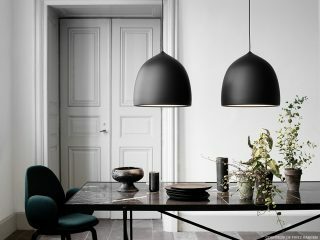 The green-blue hue of the tray ceiling serves as the focal point, while the gray walls are complemented by the crisp white molding and bedding. 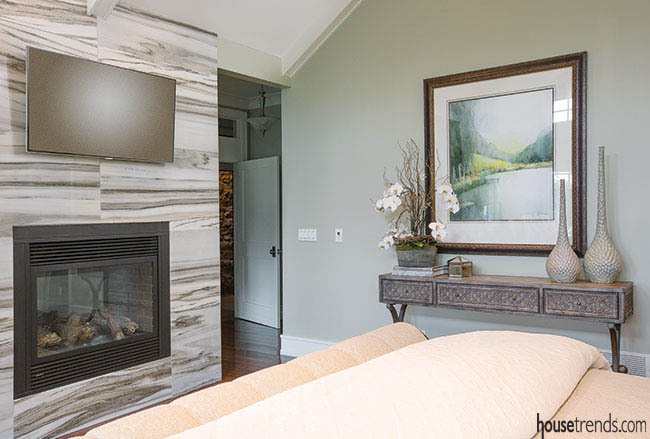 The elegant light fixture and stone fireplace help to establish the contemporary aesthetic in the serene space. For this bedroom, there’s no such thing as too much pink. 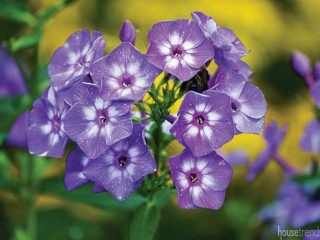 Combining a few varieties of the frilly color, along with eye-catching window treatments, helps to create a private space for a young girl to be herself. 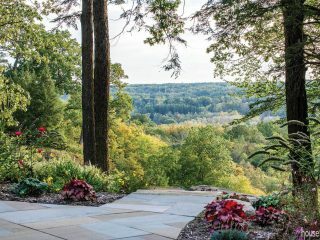 Interior designers: Jennifer Bannon and Rosemarie Nair, Interior Decorating Company, Inc. 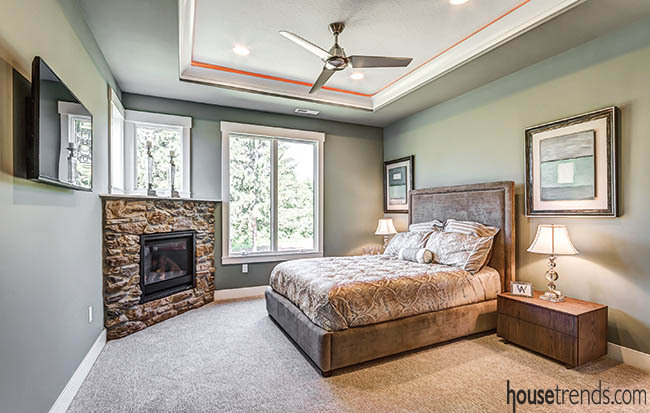 Muted earth tones, accentuated with deep burgundy and chocolate brown hues, set the stage in this bedroom. The box beam ceiling and simple wood trim help to establish the Craftsman-inspired design. 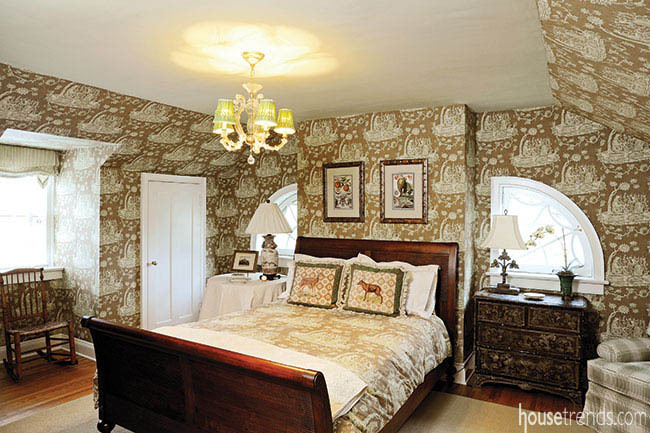 The bold pattern of the animal print chairs gives this elegant bedroom a little edge. Paired up with an intricately carved king bed and splashes of soft white and beige, this bedroom knows how to take charge. 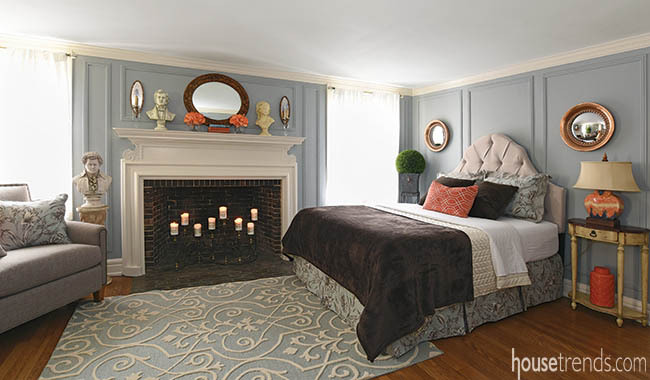 Touches of gray, blue and cream are anything but dull in this cozy bedroom. The solid color of the window treatments complements the patterned bedding to complete the inviting design. This luxurious bedroom takes pampering to the next level. Hotel-inspired amenities such as the plush upholstered headboard, window treatments that block out the light, and lush bedding in soft beige hues create the perfect retreat to wind down after a busy day. 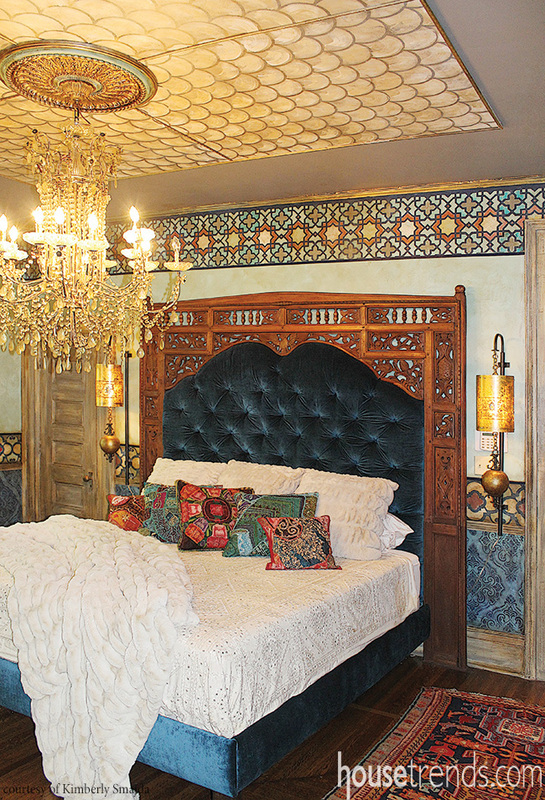 This bedroom brings the vitality of Morocco to life thanks to an intricately carved wood bed, patterned throw pillows and colorful wall and ceiling treatments. A splash of sunny yellow pops against the linen, cream and taupe tones in this bedroom. An abundance of natural light further complements the cheerful room. Builder: R.A. Snoznik Construction, Inc.
A celebration of pink and orange greets early risers in Muirfield. 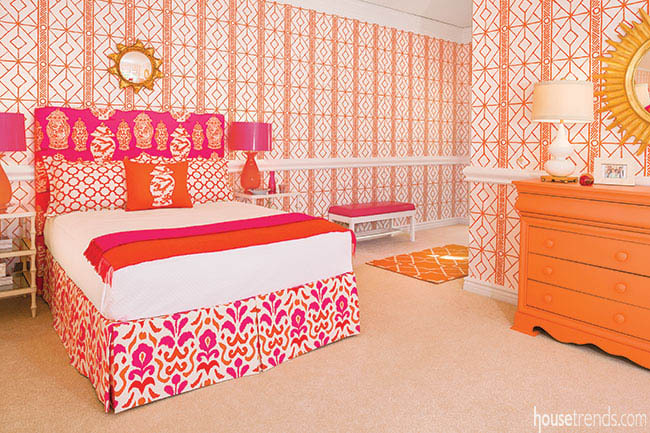 Wallcovering installation: Michael Webb, C.P. A sea-inspired palette and a dramatic canopy give a bold start to a new day in this Columbus home. Matching the duvet cover, Scalamandre´ toile paper on the walls provides plenty of visual stimulation in this Cotswold-style home in Bexley. 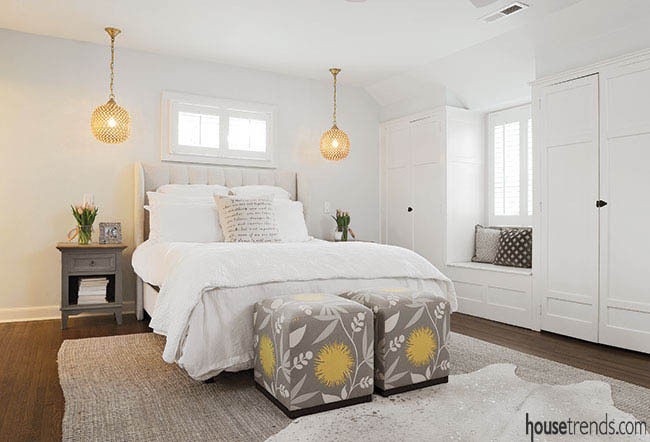 A neutral color scheme with large area rugs and warm pendant lights soften this Bexley room and make it ready for sleep. 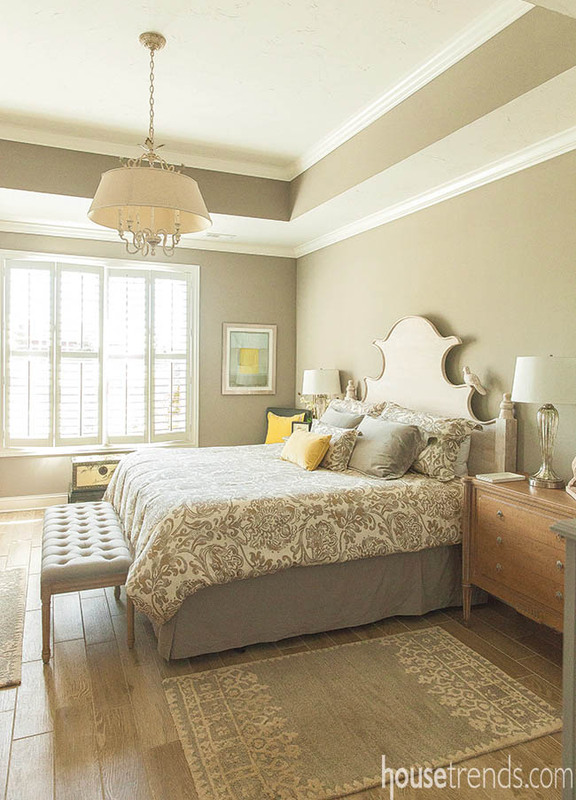 An elegant bedroom finds a new life in a recently restored historic Lancaster home. 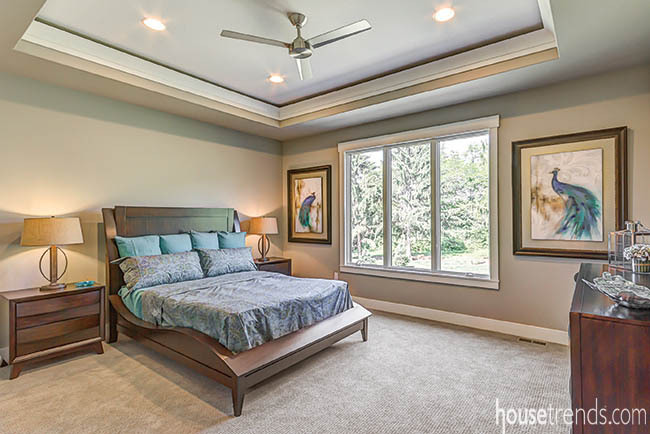 Calming blues invite restful nights in Upper Arlington. A fireplace does a great job of warming up the mood and is perfect for winding down in this Zanesville home.